Jurancon was long known for its sweet wines and indeed if you only see the name Jurancon on the bottle label it will be a sweet wine. However, in recent years the popularity of the region has grown because of its dry wines which will carry ‘Jurancon Sec’ in the label. 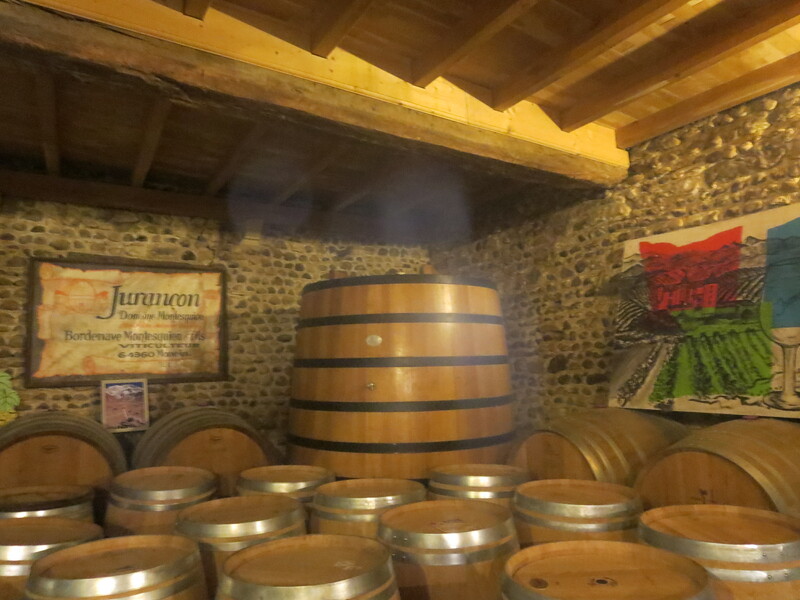 All Jurancon wines are white, red wines are made in the area but they carry other names such as Coteaux Du Béarn. I combined a recent visit to Biarritz and the Basque coast with a few days in the region, was able to taste some of the wines and visit two of its very best domaines which were mentioned to me by everybody I spoke to about the wines of the region. Jurancon is grown to the west and south of the city of Pau in the Pyrénées – Atlantiques. The vines are to be found in small parcels around the tops of hills and ridges and these vineyards were so different to the monoculture of the Hérault or Bordeaux, Burgundy and the other more famous French regions. Other crops such as maize and fruit are more widespread than vines along with plenty of cows and sheep. It makes for a truly lovely countryside, admittedly the autumn colours of the trees and vines highlighted that beauty to best effect. The soils are clay and gravel though some areas also have pudding stones, big pebbles which retain heat. 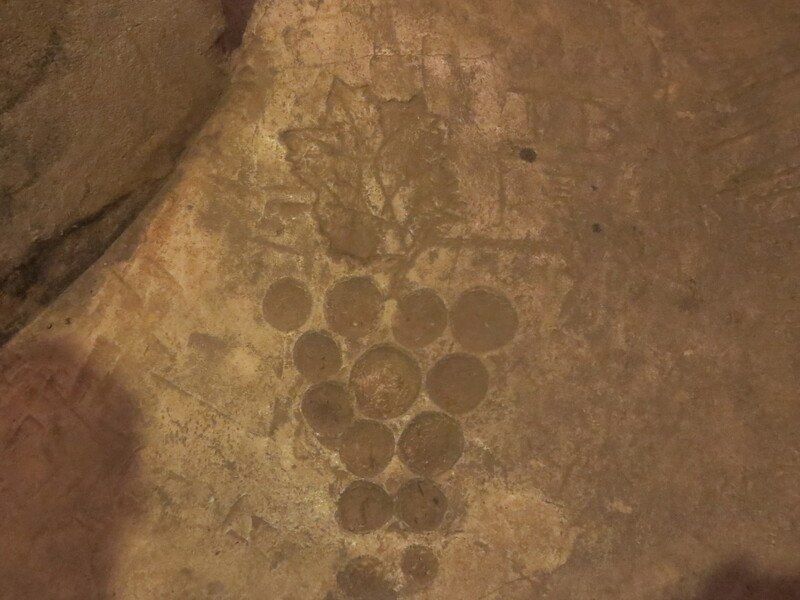 One of Jurancon’s attractions is its unusual grape cépages. Gros Manseng makes up around 60% of the region’s grapes, with its close relative Petit Manseng forming around 35% of the rest. 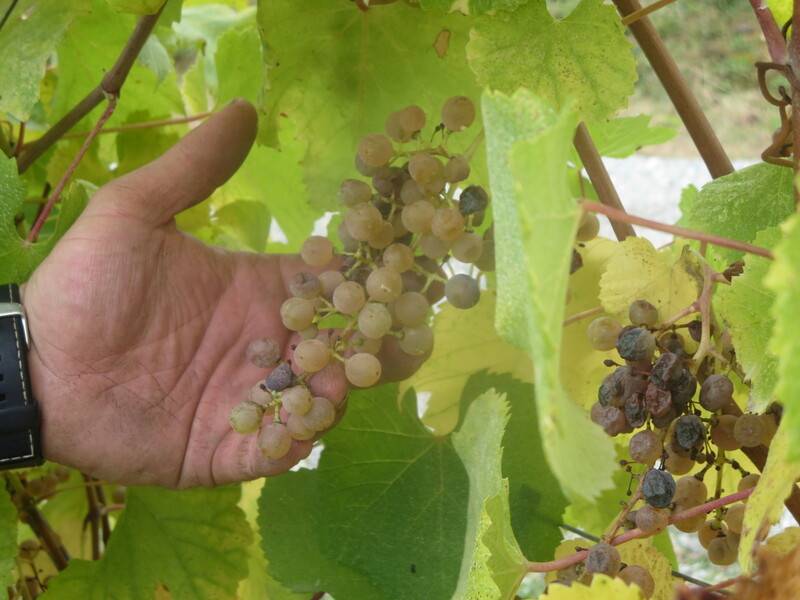 Gros Manseng is often the main force of the dry wines and Petit Manseng is the most important grape behind the sweet wines. 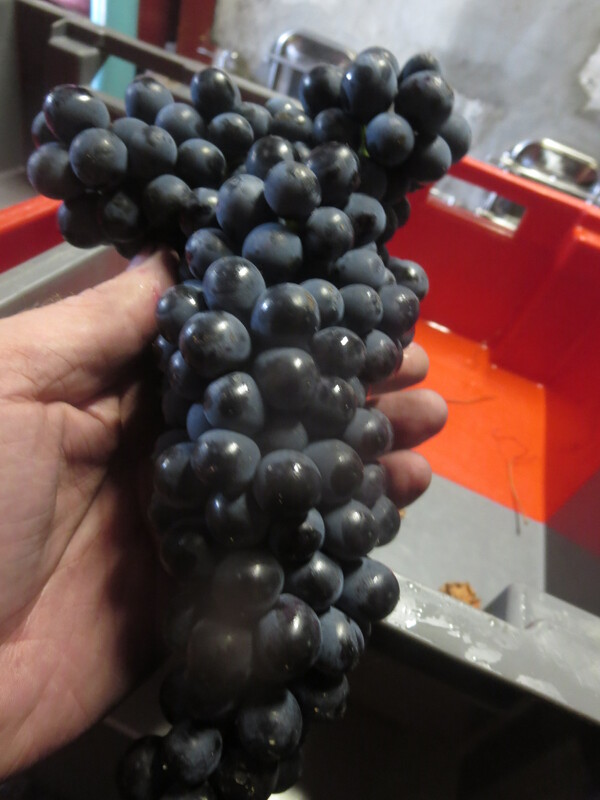 Petit Courbu is the third main variety with Camaralet and Lauzet being the minority cépages, described as accessory grapes by Jean – Louis Lacoste at Domaine Nigri. These grapes give Jurancon wines a sense of place and also a sense of being different to the rest of the world. 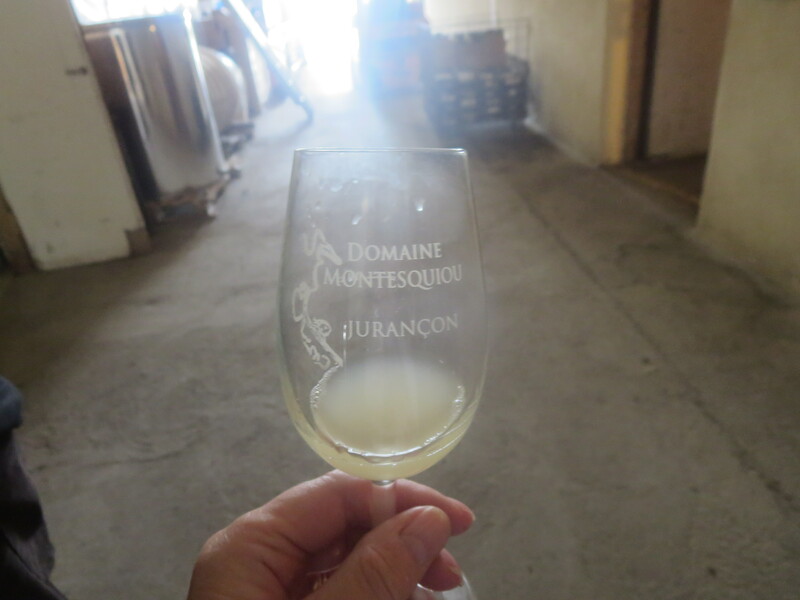 It was the dry wines of Domaine Montesquiou which first attracted me to the region and made me want to visit the Jurancon. I bought them in the UK from Leon Stolarski, an excellent online merchant with a range of excellent small, independent growers. After buying one or two bottles as a change I became convinced that these were wines of the highest quality, amongst my favourite white wines in the world. 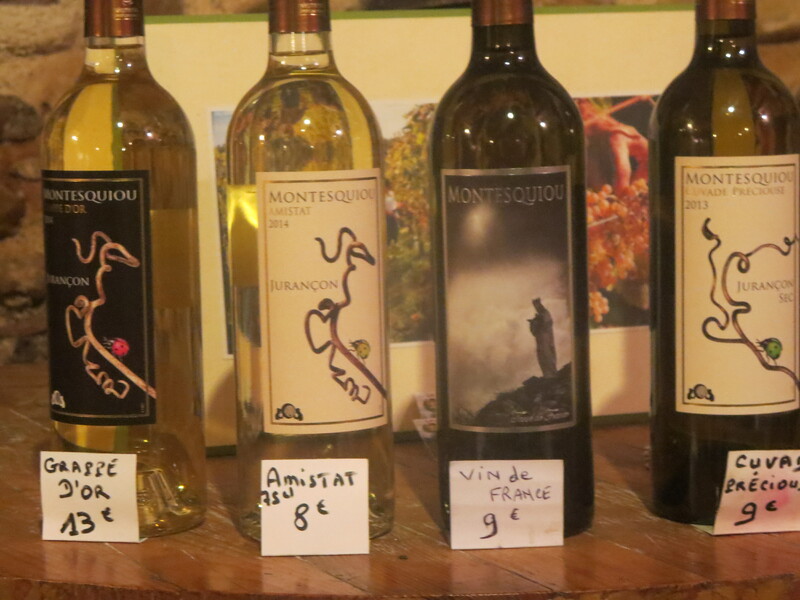 Therefore my first visit to a domaine had to be to Montesquiou, which is found on a hill in the commune of Monein. I was greeted by Sébastien Bordenave Montesquiou and his brother Fabrice who run the domaine these days, as well as their father. 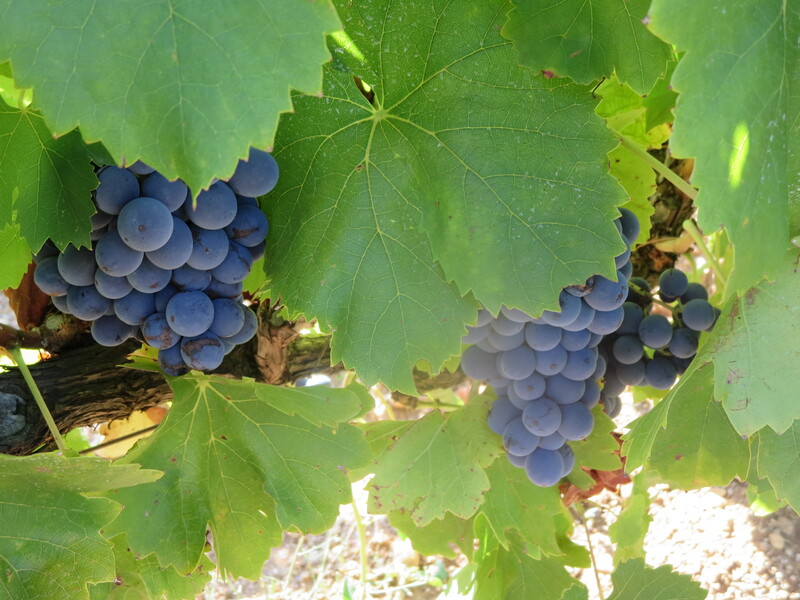 I felt somewhat guilty as even though the vendanges were finished in the Languedoc, here they were still in full swing. The dry wines are in cuve but they had only started to pick grapes for the sweet wines 2 or 3 days before my visit and will be picking for another month. 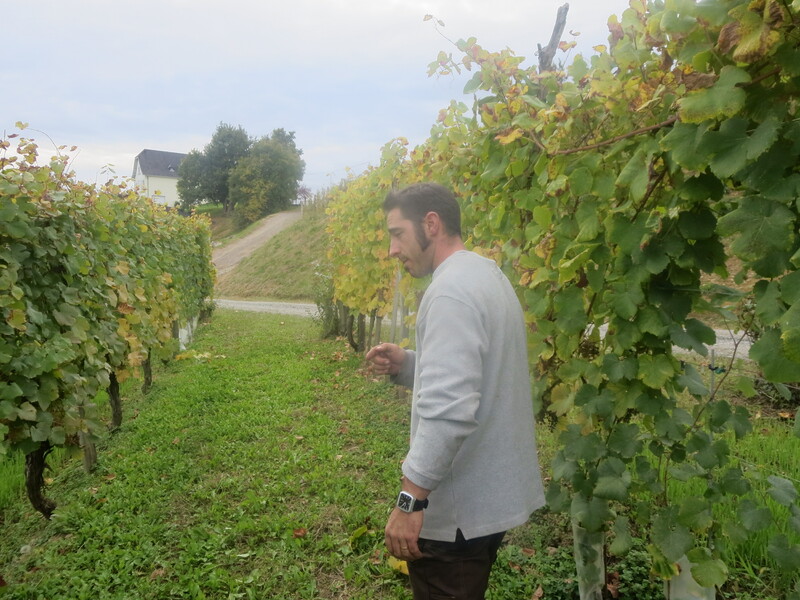 However, there was no vendange on the day of my visit (October 19th) and Sébastien generously gave his time and showed me into some vineyards as well as the winery itself. 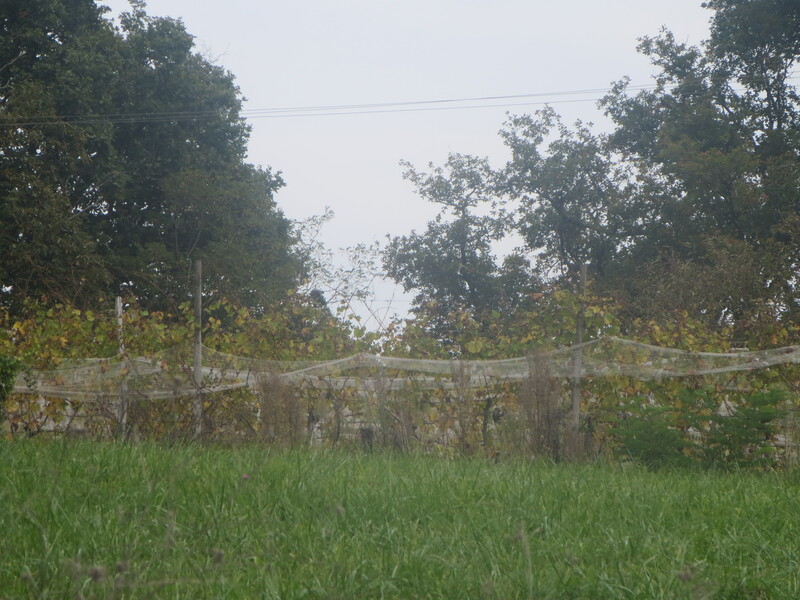 The vines themselves were different to those I am more accustomed to in the Languedoc. 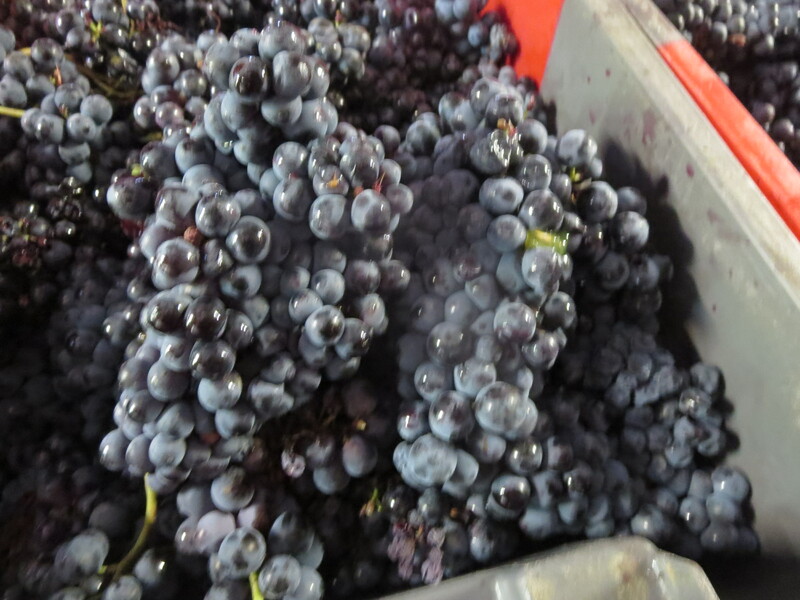 They are tall, with the bunches of grapes at waist height, much easier for picking! 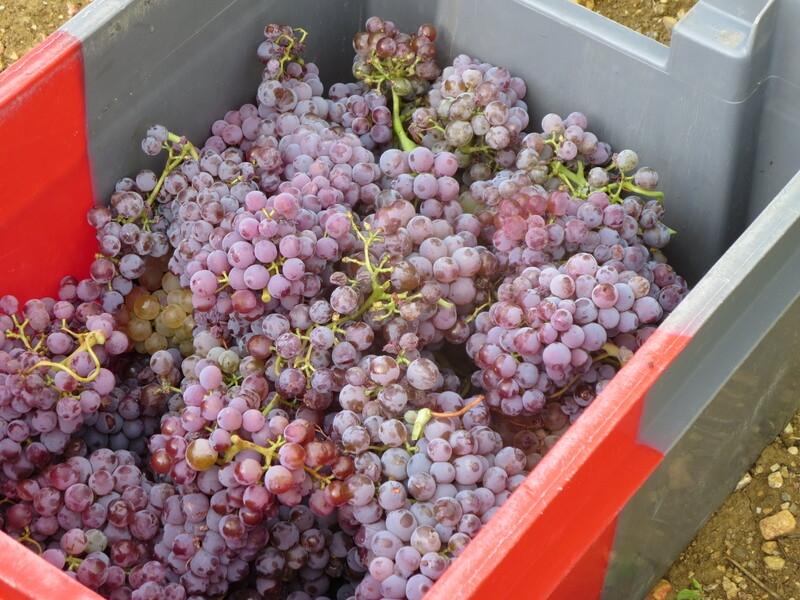 Those left on the vines were being left to dry in the autumn sunshine, becoming passarillé, concentrating the sugars in the juices. 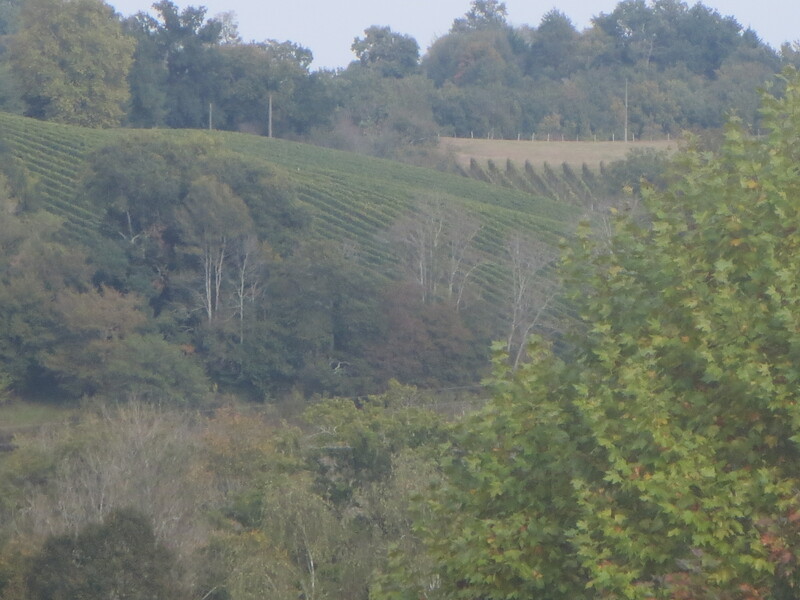 The vines face mostly eastwards , not overly exposed. Between the vines oats had been sown in spring to provide competition for the vines so that they have to compete and struggle a little rather than becoming too vigorous. The oats are not allowed to develop fully but the leaves were still evident. 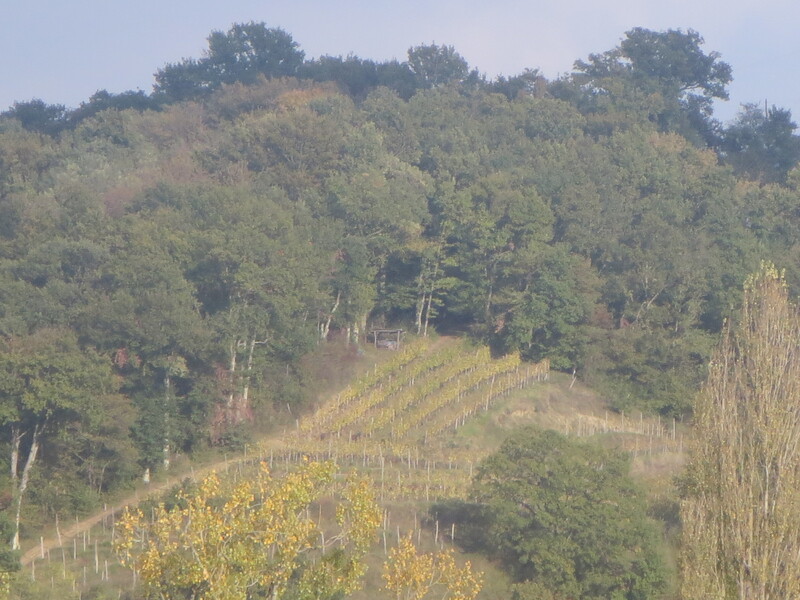 As Jurancon vineyards receive more rainfall than any other French region these crops also help to avoid soil erosion on the steep slopes where the vines are found. Ploughing is therefore rare too. Most vines are pruned with Guyot double though Sébastien told me the trend is towards Guyot simple. 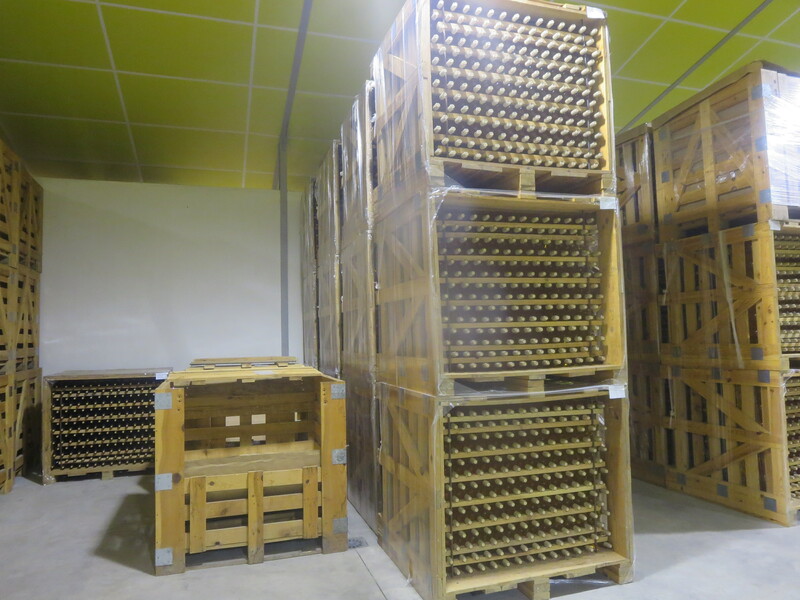 The dry wines are fermented in stainless steel and cement tanks, some then being aged in barrel some left in the tanks for different cuvées (L’Estela is the non oak aged, Cuvade Préciouse the oak aged). We tasted some of the 2015 wines from tank and they are already losing their puppy fat and becoming lean, spicy, zesty wines with a range of long flavours filling the mouth. Both of these wines are dominated by Gros Manseng with L’Estela also containing 40% Courbu (and a small amount of Petit Manseng) whilst Cuvade Préciouse also has 30% Petit Manseng. These are thrilling wines, full of spice, citrus and a delightful clean finish. 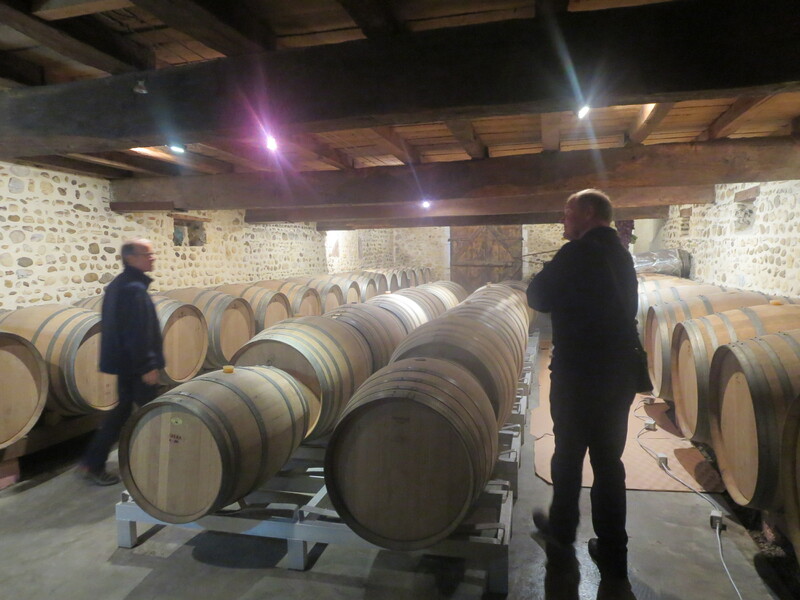 Sébastien took us into the barrel room where the wines were literally hissing as they fermented inside. I am very wary of oak barrels I must admit. Too many heavily oaked wines in the 1980s and 1990s left me preferring fresh, unoaked flavours. However, even I will admit that when used judiciously, oak barrels can add complexity and depth to a wine, the interaction with the wood and the small amount of oxidation bringing extra nuances. And here the use of oak is masterful. Cuvade Préciouse is still zesty and has a delicious clean flavour but the oak adds a roundness and a slight nutiness. Brilliant stuff. I would drink L’Estela every day, it is my ‘go to’ white wine. As I talked to him Sébastien’s enthusiasm and passion were evident and he reminded me of Jeff Coutelou in his love of the vines, land and his wines. He spoke about the use of oak and how he is like a choirmaster with the grapes, wood, oxygen and yeasts all voices which could compete and clash but with careful training and guidance these different voices become harmonious to produce a sound which is greater than any single element. Onto the sweeter wines. Amistat is a 100% Gros Manseng wine which is more a demi-sec rather than a moelleux. It starts as a dryish wine with exotic fruits and a lean, clean streak and then a little sweetness establishes itself in your mouth on the finish. 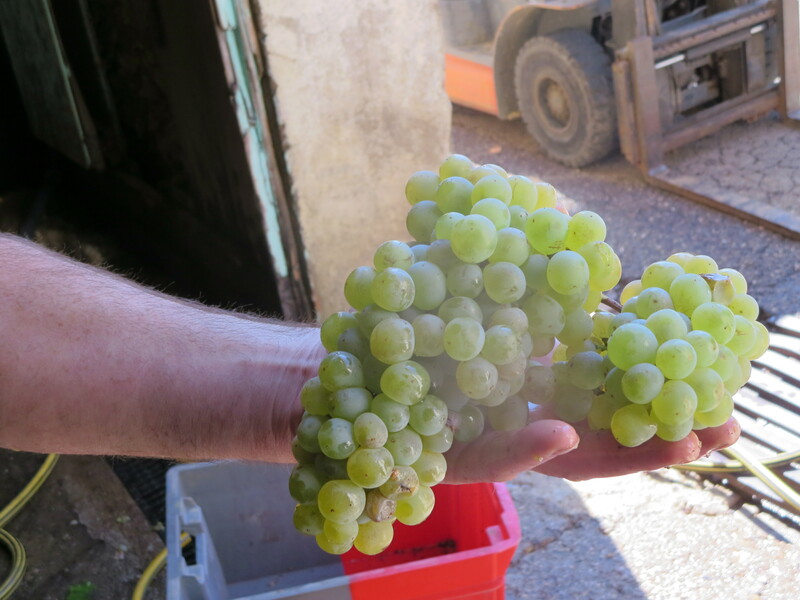 This would make a great apéritif wine, lovely. Vin De France has a lovely photograph on its label. It is unclassified Jurancon wine because there is slightly too much residual sugar for a Jurancon sec, again it would strike me as a demi sec style wine. I loved this, it had a real length and yet despite that residual sugar it remained refreshing and balanced. Finally, onto La Grappe D’Or and the archetypal Jurancon wine made from Petit Manseng. Luscious and sweet with spice and apricots yet with a refreshing line of acidity to cleanse the palate, it lingers and grows in the mouth. Brilliant winemaking. 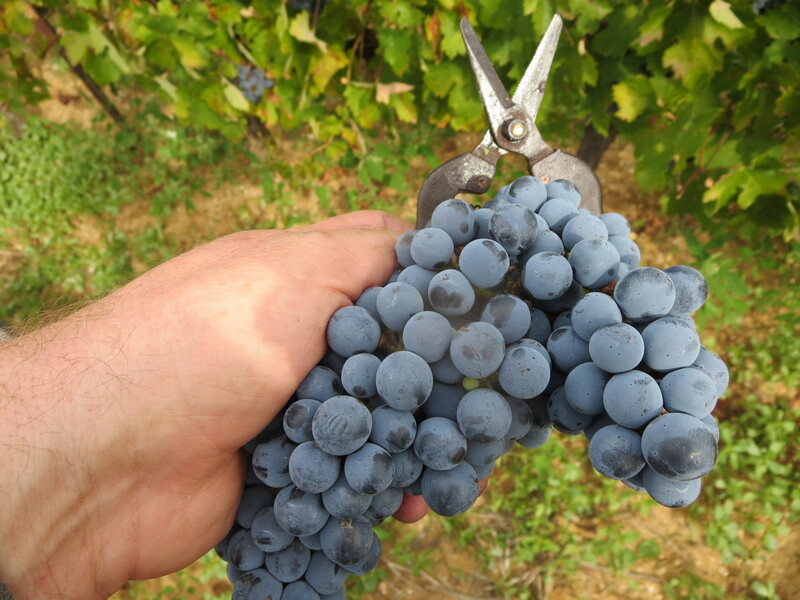 The grapes for this year’s wine are still on vine and will be harvested into November, though all the vines are a week or so ahead of the average year. Sébastien’s parting shot was that he seeks to allow the grapes to express themselves, a reminder to me of Jeff’s words near the end of harvest that you should always have faith in the grapes that you have grown, they will do the job of making great wine if you help them rather than seek to control them. Kindred spirits. 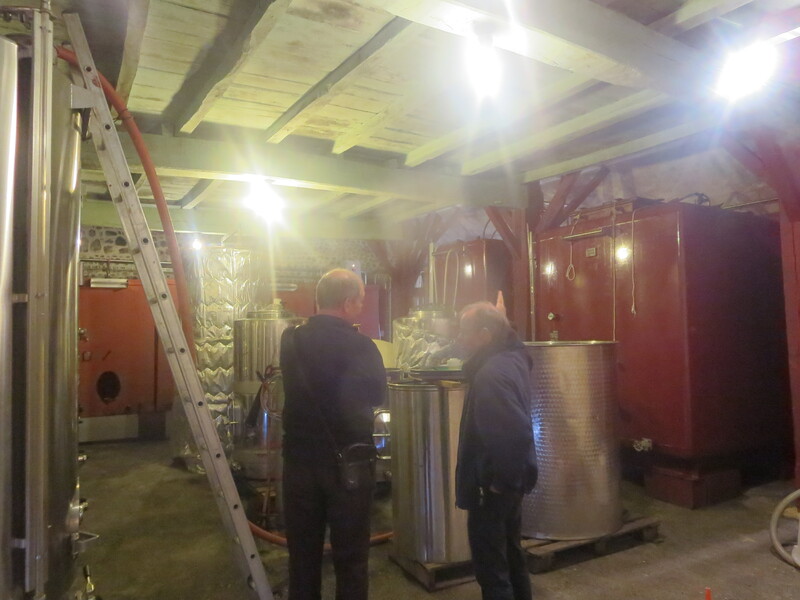 Indeed the brothers are starting to experiment a little with natural winemaking. This is one of my favourite domaines, every single wine is top quality and Montesquiou are, in my view, the producers of the very best Jurancon secs. 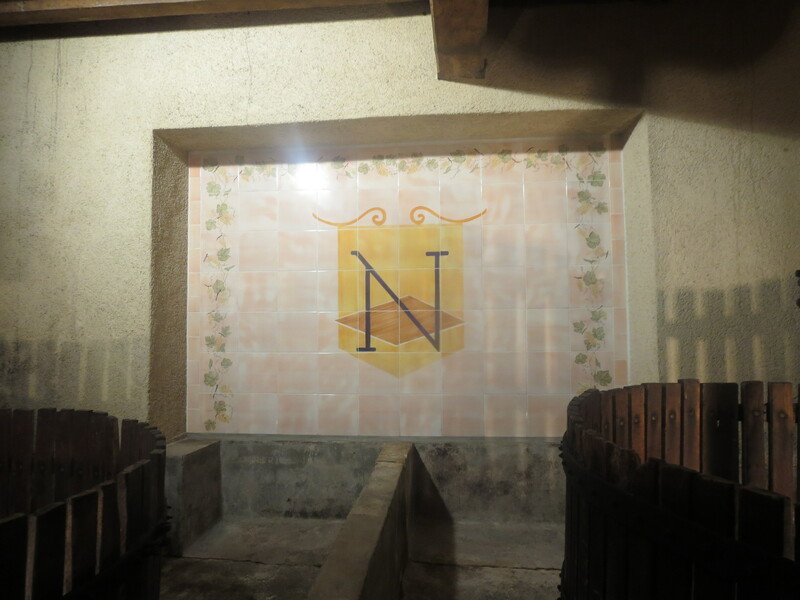 The following day we went along to Domaine Nigri. 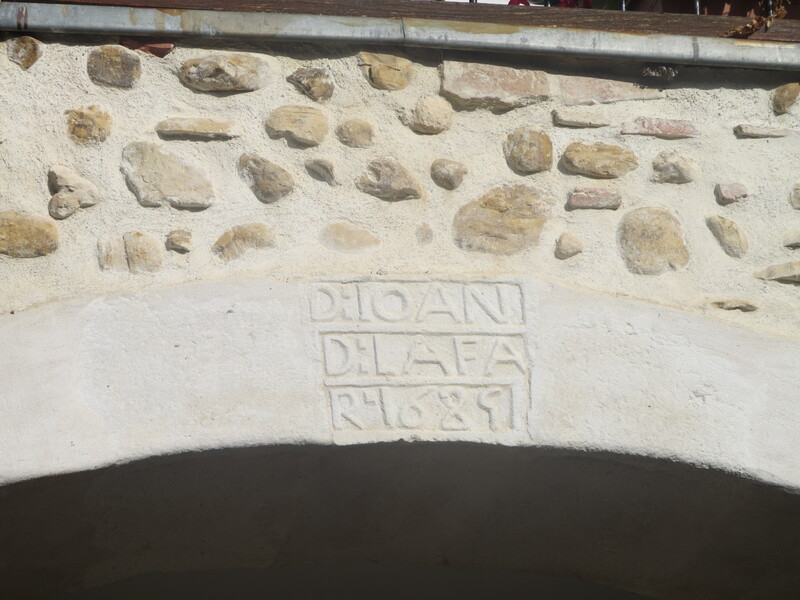 Jean-Louis Lacoste runs the domaine which has been in the family since 1685. 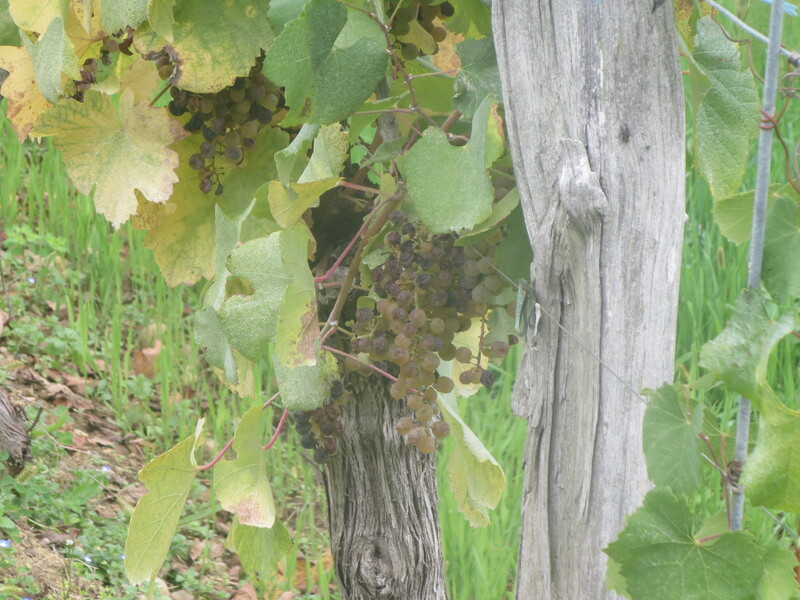 Now organic, like Montesquiou, the domaine is unusual in the region in having mostly Petit Manseng. I think this is reflected in the quality of the sweeter wines which are the mainstay of Nigri and are wines of the very top quality. 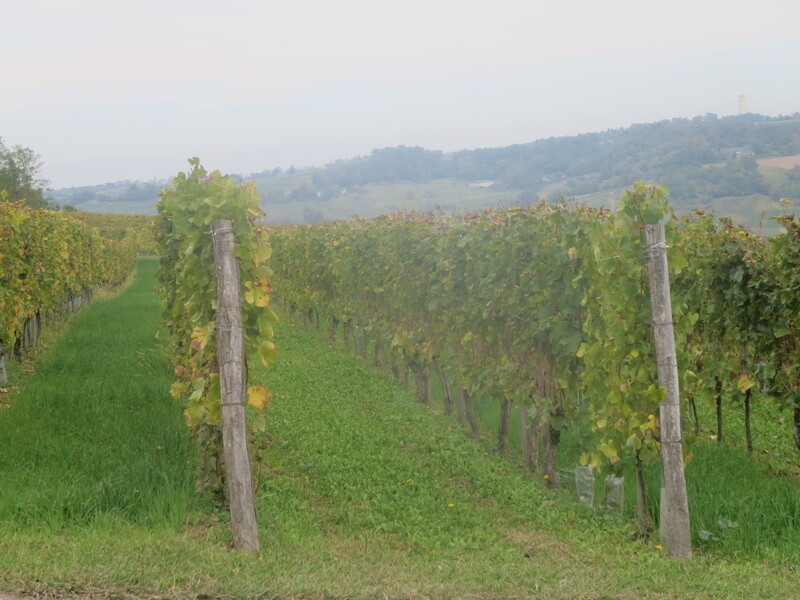 Much attention is given to training the vines to ensure as much aeration as possible and the land between vines has a grass covering for aeration and to avoid erosion. 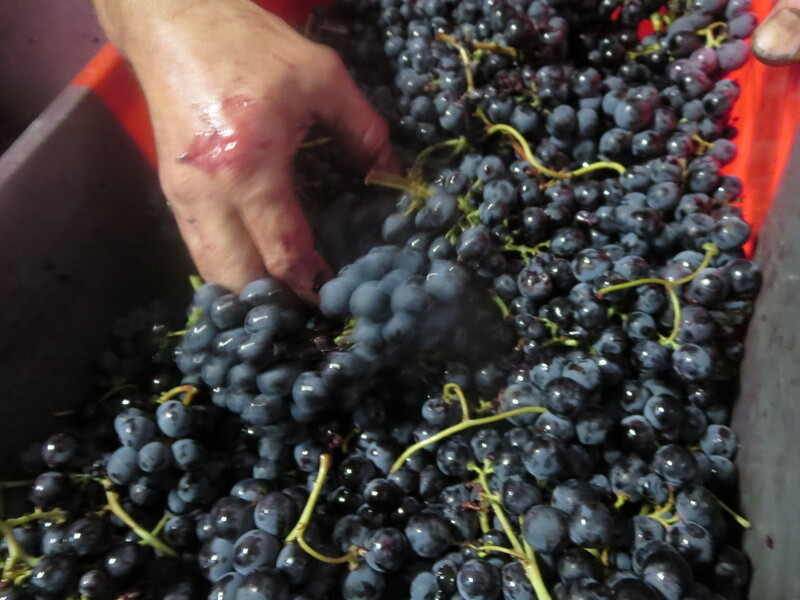 The cépages are harvested separately and the parcels vinified separately to express the terroir. 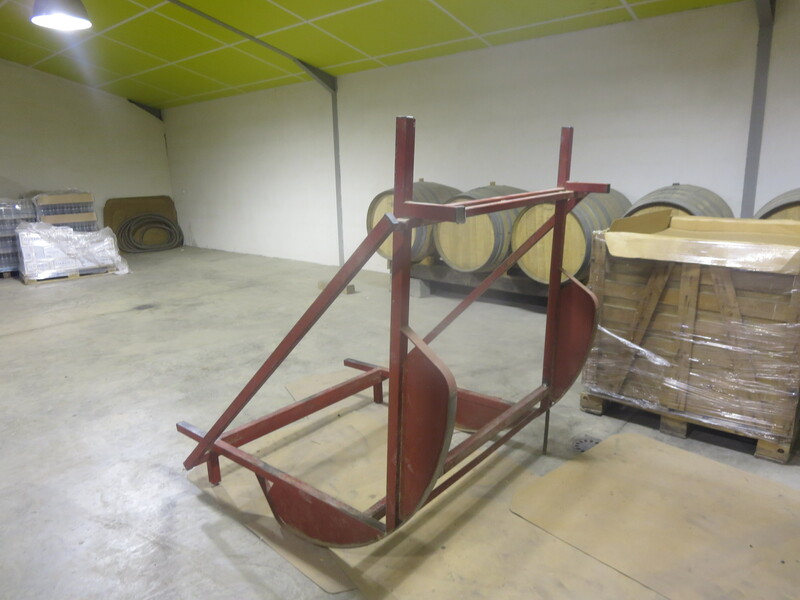 The wines rest on ther lees for 6 to 11 months to maximise the expression of the wine. 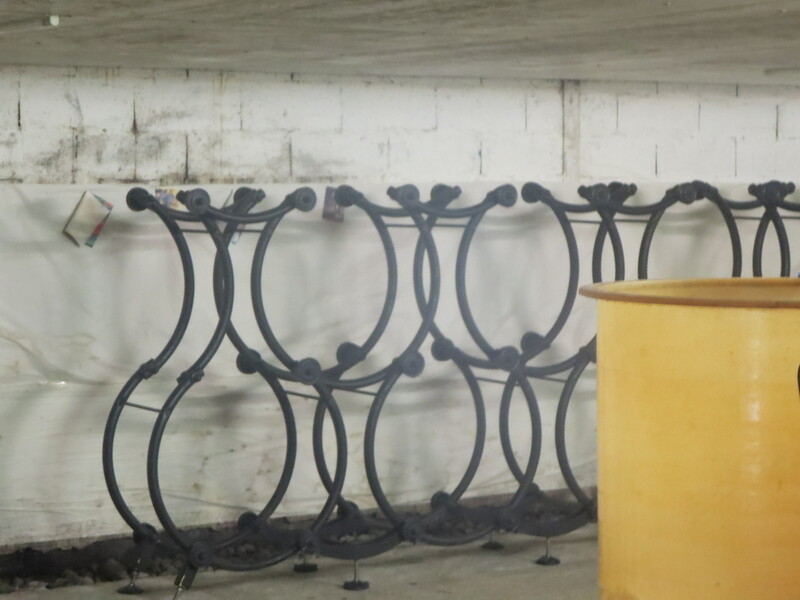 Again the use of barrels for ageing is carefully done allowing slight oxygen exchange without overpowering the flavour of the grapes themselves. After a tour of the winery we tasted the range. Confluence is a Jurancon Sec and unusually contains 10% each of Camaralet and Lauzet, grapes not found in most domaines, the majority being Gros Manseng. Clear, fruity and with a very refreshing finish. The other dry wine is Pierre De Lune which is oak aged unlike Confluence. This time the 80% Gros Manseng is joined by 20% of Petit Manseng which perhaps adds the slight hint of sweetness, another demi-sec like wine. Yet there is a lovely, zesty finish which leaves you wanting more. Very good. The sweeter wines are, perhaps, the strong point of Nigri. First in the range was Pas De Deux, 40% Petit Manseng which is oak aged and 60% Gros Manseng which is unoaked. This is sweet but slightly so, a great aperitif wine or accompaniment to cheeses. Honey notes are balanced by citrus freshness, perfectly balanced and a wine you would drink more and more of. Toute Une Histoire is the main sweet wine of Nigri, 100% Petit Manseng fermented and matured in oak for 11 months. The grapes come from 3 different soils for complexity. Richer, more honeyed and viscous in texture yet always a very refreshing finish, the wine does not cloy at all. It would balance cheese but even Asian foods perhaps. Truly delicious. 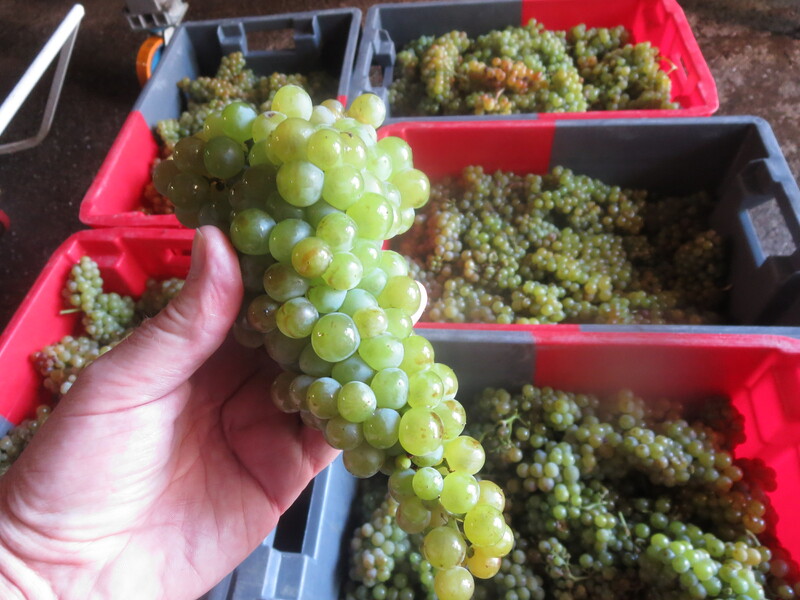 Hors De Piste is the top wine, again pure Petit Manseng, the best of the grapes go into this cuvée. It actually looks a little less golden in colour but is more intense and full. It fills the mouth with sweetness but once again the freshness kicks in and the wine lingers leaving delicious flavours of quince, orange and apricot. Exceptional. The more I visit wine domaines the more convinced I become that the wines reflect the vigneron. 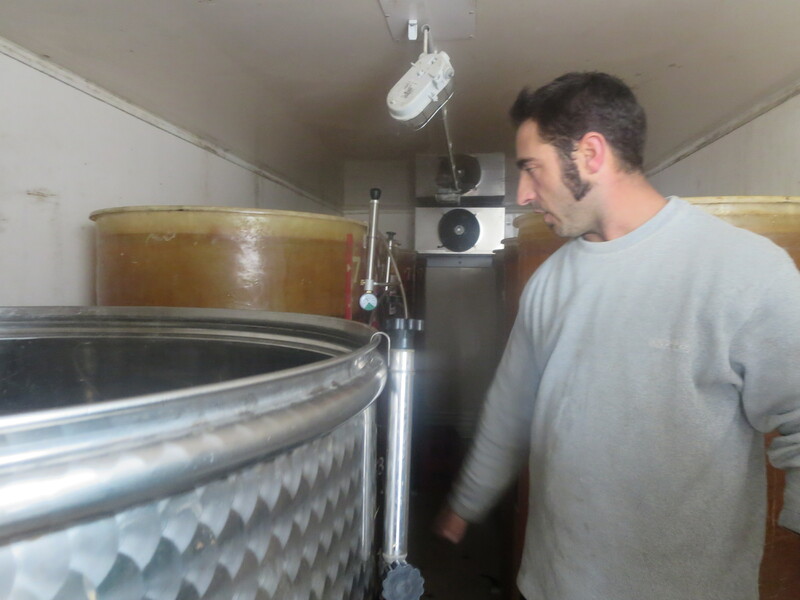 Jean-Louis is a quiet, reflective man but passionate about his vines and wines. The wines show that same subtlety but open out into full flavours, welcoming and expressive. 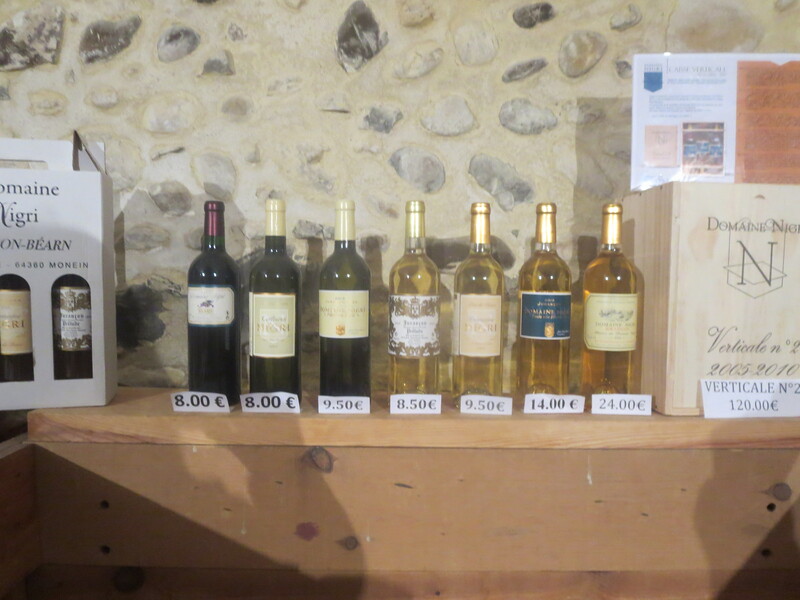 As at Montesquiou I was happy to buy the range of wines. I tasted a number of other wines in the area, some were frankly disappointing, some OK. I would mention Domaine Bellegarde’s Jurancon Sec which offered a citrus, fresh and fruity range of flavours. These two domaines stand out to me and I enjoyed every single one of their wines. They are great to drink now but will also age well, and the sweeter wines especially will broaden their flavours. Seek out, buy and enjoy the wines of Domaines Nigri and Montesquiou. Jurancon, a beautiful wine region with wines to reflect its nature. Categories: Vignerons, Vines, Wines | Tags: Camaralet, Gros Manseng, Jurancon, Lauzet, Montesquiou, Nigri, Petit Courbu, Petit Manseng, sec | Permalink. This is the most detailed account of a Jurançon trip I have read since I read Paul Strang’s book and he wasn’t sufficiently aware of Montesquiou. Nigri, on the other hand, I don’t know at all. Lovely region, though I know it slightly less well than nearby Irouléguy. Your notes do demonstrate some of your newly assimilated viticultural knowledge. Just sipping a vin des Amis as I type. Perfect for the first night of winter as the clocks went back. Leon I agree, the levels of sweetness seem much more controlled than with botrytis, it was something which Sébastien pointed out to me and immediately I could see what he meant. He did remind me very much of Jeff. How on earth did you first come across them, it is certainly not on the beaten track? David, glad you like it and thank you for the comments. I did taste some Irouléguy whilst in the Basque region, Ilaria, Etxegaraya, Arretxea in particular. I had only ever had the whites before so was fascinated by the red wines which I think I preferred, especially Arretxea. That’s a great story Leon. I’d be quite happy with just their wines and the reds of Jeff on my desert island. Don’t forget I tasted for Hachette this year so no criticism from me! Thanks for highlighting these 2 producers in the Jurancon region. 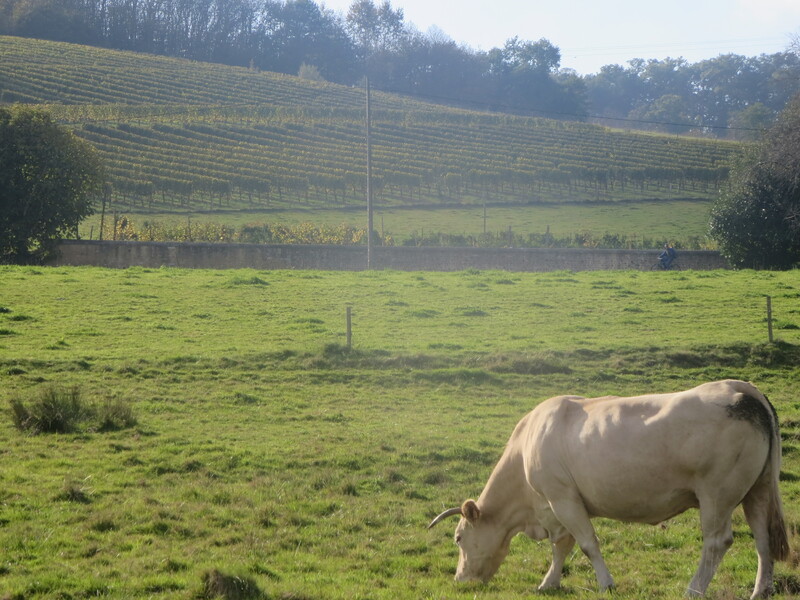 We spent a week in the Basque region 2 years ago, and made an excursion to the Jurancon area (I wrote about it here: http://mainelywinenews.blogspot.com/2013/03/appellation-spring-continued-on-to-tarn.html). 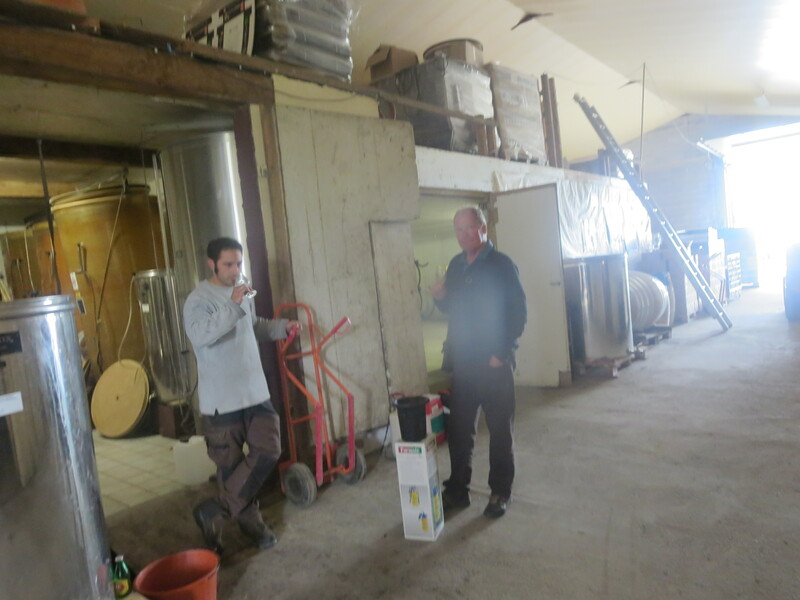 We visited 2 producers; Chemin Larredya and Domaine Bordenave. Next April we’ll be spending a week in Gan, right near Monein, so we’ll be sure to visit the 2 you went to, plus others. It’s a beautiful area, and the wines are fascinating. Thanks for the comments and link Bob. As mentioned above I got to taste some Irouléguys and would love to explore that region. I was quite smitten by the areas we covered including Navarrenx. I shall follow your travels with extra interest. Please do try the 2 I mention, I’m sure you’d like them.